2017 has been a good year for players at Casumo casino. They’ve managed to raked in over 20 million in jackpot wins on some of the top NetEnt jackpot games. But which slot can claim most of the glory? There might have been smaller jackpot wins on other games at Casumo in 2017, but it’s the big ones that stand out from the crowd. You know the ones; those that create instant life changing wins with good stories to boot. We’ve covered some of them here in our big winner stories throughout the year, along with other winner stories from top casino sites like Vera and John, Royal Panda and Rizk. But what this story is about is a celebration the best jackpot slot machines where you can win real money on, at one of the best casinos of the year, all for as little as 0.20 per spin. And just because the jackpots have already hit, doesn’t mean that they won’t hit again, and again and again, with millions waiting for just the right player, or any player, just like you. Our first story starts off on March 30th when one lucky 28 year old found himself €3,317,639 richer thanks to some late night play on this top NetEnt game. The Mega Fortune slot is the original of the two Mega Fortune games, and after a late night shift of work was the perfect choice, even though our soon to be winner didn’t usually play jackpot games. In fact his favourites consist of two other Net Entertainment games, Gonzo’s Quest and Jungle Spirit, but not any more. So after such a big win, what do you do? Well, this 28 year old is already thinking of retiring at the age of 28. Oh we wish we could have had the money to do that at his age. But while he thought about it, a trip to the sunny Maldives was in store. Not a bad way to start the year. April was the month for unprecedented jackpot wins at Casumo as two struck within only a few days. Our first story starts with a huge €4,621,607.81 win on the luxurious slot machine Mega Fortune Dreams. A 5 reel, 20 payline game, this low to medium variance slot has a minimum bet of 0.20 and a return to player rate of between 95.9% and 96.4%. But it’s the free spins with multipliers and the wheel of fortune bonus game that gets players excited over the 3 progressive jackpots. Mega Fortune Dreams has paid out over 30 million in the past year. Most surprising of all, this is the video slot that’s paid out the most in 2017 in comparison to all the other NetEnt jackpot slots. And Casumo players have enjoyed quite a few of them. April 8th, 4 days later from the Mega Fortune Dreams jackpot win, another of NetEnt’s online slots bursts and hits at over 3.3 million. We don’t have much detail on this, but we can tell you about the slot in question. The Arabian Nights video slot is one of the oldest jackpot games in the NetEntertainments portfolio. 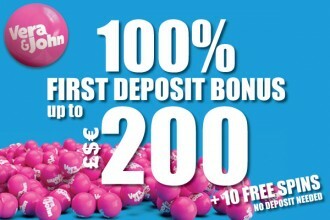 With 5 reels, 10 paylines and a 95.6% return to player rate it is a simple slot at heart. With wilds that double your wins and free spins with 3x multiplier, if you’ve not played it before then it’s worth a look if you prefer your games to be classics. Currently only available as an online slot, but we know that NetEnt are moving all of their older slots to mobile in the near future. However, with a minimum bet of 0.50 it’s one of the highest starting bets of the progressive slots on our list. But like one lucky player found out, can be highly rewarding paying out millions. And the best thing, you get all your winnings straight in to your bank account, no waiting around or getting it in instalments, just cold hard cash. After a short break of big wins at Casumo, they come back full force in August 2017 with perhaps not the biggest win of the year, but one that we would make one person very happy. 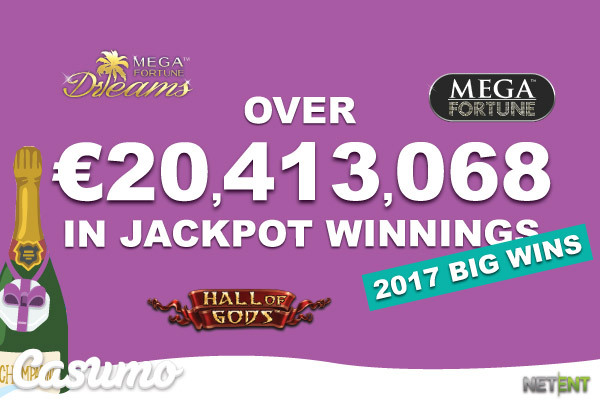 Over £2,767,467 is a tidy sum to win, and once again it’s not the original Mega Fortune game that hits, but the sequel Mega Fortune Dreams. We’ve already given you the details on what you can expect when playing, and by now you should know how much potential there is to win, so we shall quickly move on to the fifth and final Casumo jackpot win of the year. We move on a few months and it’s now November 17th 2017. The Hall of Gods jackpot has risen to over £6 million and one UK player is about to go on a shopping spree. Yes, lucky Neil from Aberdeen in Scotland was the winner of £6,373,373 and his story is one of true luck and awe. He signed up to Casumo, took a look around and placed his first bet of £4 on the Hall of Gods slot. Within a minute later he was looking in amazement at his laptop screen as the 6 million jackpot flashed up. He couldn’t believe his eyes, but knows exaclty what he’s going to do with his winnings. A fan of football and a Liverpool FC fanatic, he knows that a season ticket or even a box at his favourite football club is in store. Then a few trips to see family around the world from Tenerife to Australia and, just to show that gambling online isn’t all evil and can help others, the Macmillan Cancer Research will get a nice donation. Now that’s a man who’s thought long and hard about winning. As for the rest of his millions, well, only he knows what he will spend it on. There are more than just NetEnt jackpots to play at Casumo, the multi millionaire making Mega Moolah by Microgaming, for one, is one of the most popular games. But if the last year of jackpot wins at this quirky online and mobile casino site gives us any insights of what to do, it would be to play on NetEnt games. The casino slots that first brought Casumo on to the world gambling scene, but have since helped it grow in to a multi-software site offering players from UK, Sweden and even Canada the opportunity to take a spin. And the game we’d recommend, of course, is the Mega Fortune Dreams slot as the most paying slot of the year. So go play and see if how many spins it’ll take you to become the next big winner at one of our favourite casino establishments.